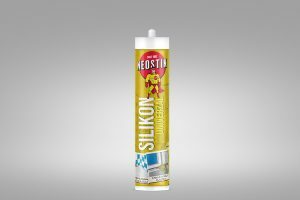 Silicone and acrylic sealants Neostik with non-sag formula offer you a full range of solutions for sealing, repairs, and installation of the various components. They have a powerful adhesion to many materials, such as wood, metal, ceramics and plastic, providing a high and durable adhesive strength. Permanently elastic sealant on acetic basis Neostik SILICON UNIVERSAL has excellent adhesion to a wide range of materials. It is suitable for sealing less stressed joints on the installation and sealing of the glass. Permanently elastic sealant on acetic basis Neostik SILICON SANITAR is ideal for glazing and sealing joints where there is a possibility of development of mold. Moreover, it has an excellent adhesion to a wide range of materials. Permanently flexible sealant on neutral basis Neostik SILICON NEUTRAL has excellent adhesion to all building materials. It’s non-corrosive and it is highly resistant to UV light, ageing, and a wide range of chemicals. 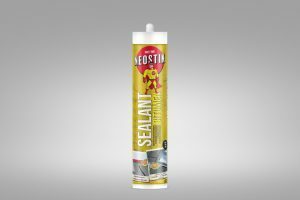 Acrylic based sealant is ideal for sealing joints of less absorbent building materials, as well as for sealing joints between walls, plasterboard and concrete elements and for sealing joints in the installation of windows and doors. Acrylic based sealant with a rough appearance Neostik SEALANT ACRYL ROUGH is the best choice for filling and repairing cracks and sealing joints of porous building materials. It’s simple to use, can be painted and it does not sag in joints in vertical surfaces. 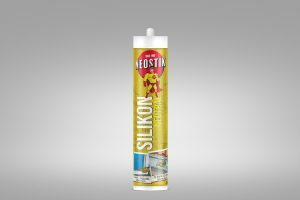 Neostik SEALANT FOR HIGH TEMPERATURES on acetate basis is intended for filling the joints, which are exposed to a constant high thermal stress, since it maintains its elastic properties up to 300 °C. Elastic bitumen-based mass for gluing and sealing of insulation material on the roofs. Neostik BITUMEN SEALANT is thixotropic and resistant to all weather conditions, UV light and rain. It adheres to damp and wet surfaces without primer.